Did you ever watch Felicity back in the day? 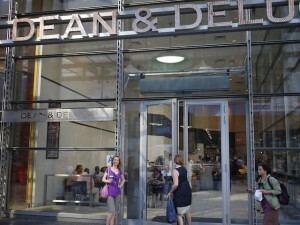 The ’90s TV show is where I first heard about Dean & DeLuca (a chain of upscale markets and espresso bars). 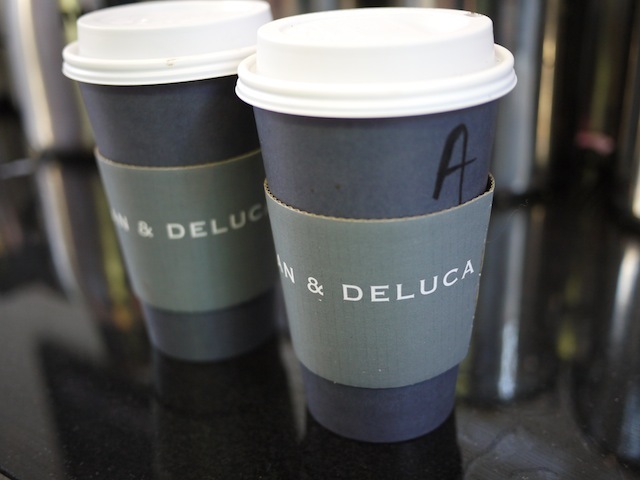 Although the company first opened in 1977 in the heart of SoHo, Felicity’s Dean & DeLuca set was modeled after their University Place café. 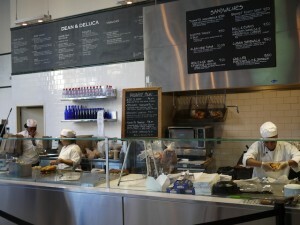 The location we recently frequented during our trip to NYC was their 8th Ave shop, in the New York Times building. This ultra-chic gourmet café was located a block from our hotel, served up an impeccable Americano and baked scrumptious pastries – we ate there a few times for breakfast. A multitude of baked goods were on display to please all tastes: giant doughnuts, hearty muffins, gooey cookies, buttery scones, pain au chocolat, almond croissants – you name it, Dean & DeLuca baked it. 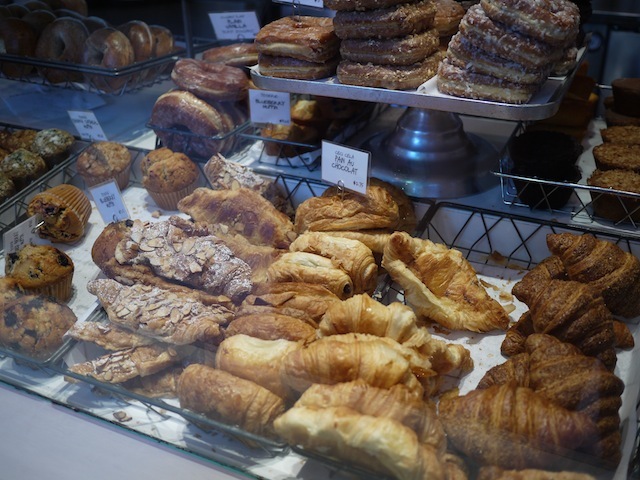 The most interesting pastry was their “pretzel croissant” – yes you guessed it, part pretzel, part croissant: A little chewier and more savory type of croissant. 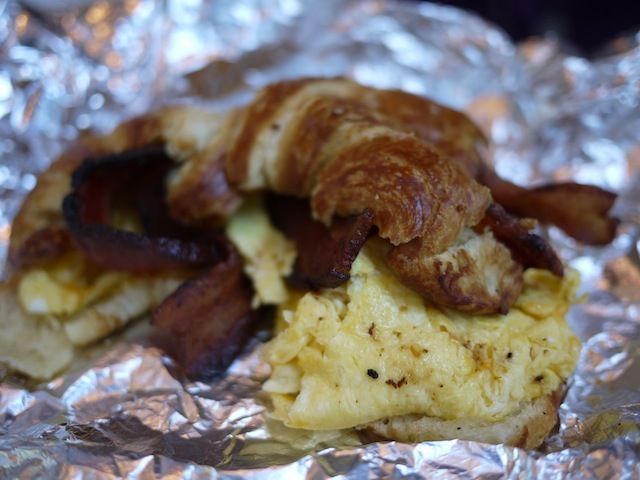 Breakfast Sandwich ($6.00) – Thick-cut extra crispy smoked bacon, with a generous portion of scrambled eggs, on a freshly baked pretzel croissant. This breakfast sandwich was so ginormous that I could not finish the entire thing! Americano 16 oz ($3.25) – Their espresso is down right perfect: Although the roast exudes a slight tartness and sweetness, it’s non bitter, and embodies a balanced acidity. 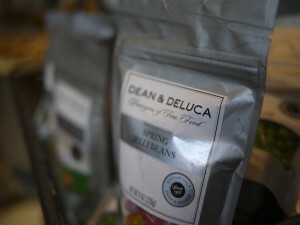 It provides a full and deep aroma, and its smooth taste has finishes with deep notes of chocolate, spice and caramel. The next day we enjoyed their regular Coffee 12 oz ($2.00) 16 oz ($2.50), and a Blueberry Muffin ($2.75) and Glazed Doughnut ($2.75), but we were in such a rush that we didn’t have time to capture photos. Overall, Dean & DeLuca serves great coffee, excellent espresso and delectable baked goods – check ’em out!